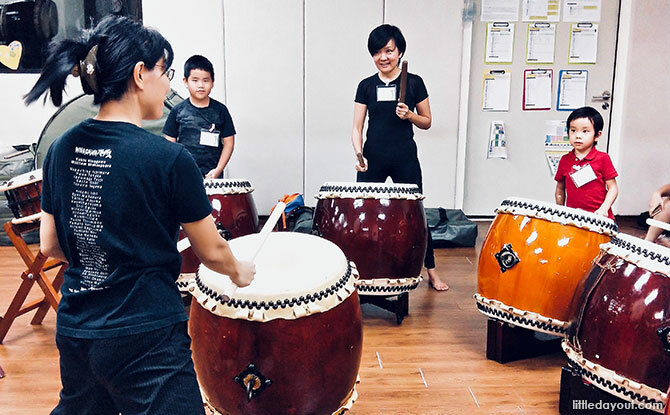 Trina shares her experience at HIBIKIYA and what goes on at a lesson on taiko drums in Singapore with kids. 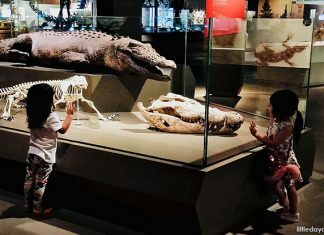 The thing I love most about raising my daughter in Singapore is how easy it is to expose her to a myriad of different cultures and influences. Living in this melting pot means enjoying French food one minute, and then watching a Spanish flamenco performance the next. Or making friends with your new neighbours from Thailand, then getting coffee from the Australian barista at work. So, when I chanced upon taiko lessons organised by HIBIKIYA, I signed up in a heartbeat. Did I know anything about taiko? Nope! Did it sound like fun? Well, if the welcome message about taking a water bottle to class and taiko drumming being “good exercise” was anything to go by, I knew my daughter and I were in for a great time! Wadaiko, or taiko for short, are traditional Japanese drums that produce a rolling sound, almost resembling the rumble of thunder. Back in the day, wadaiko was traditionally performed as prayers to appease the gods. For example, a fisherman would use wadaiko to ask for a good, big catch. Now, taiko continues to be played at events, weddings, festivals, and other joyous occasions. A typical wadaiko performance starts with a steady beat accompanied by a chorus. As the act progresses, the drummers increase the tempo and the pitch of the chorus, ending with rapid beats and quicker formations. Based in Singapore since 2000, Namiko-san first set up HIBIKIYA with the purpose of sharing traditional Japanese culture and a personal family pastime with a wider audience. 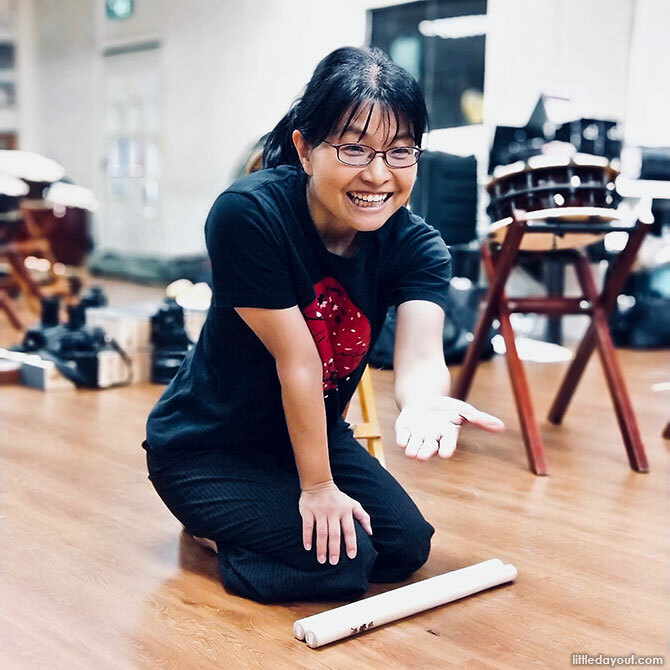 Possessing over 20 years of experience in taiko, Namiko-san has grown HIBIKIYA into one of the top taiko schools and performing troupes in the region, with numerous invitations to perform locally, and overseas. At the start of a typical HIBIKIYA taiko lesson, the children are invited to sit on the floor, seiza-style, to exchange a traditional Japanese greeting with Namiko-san. 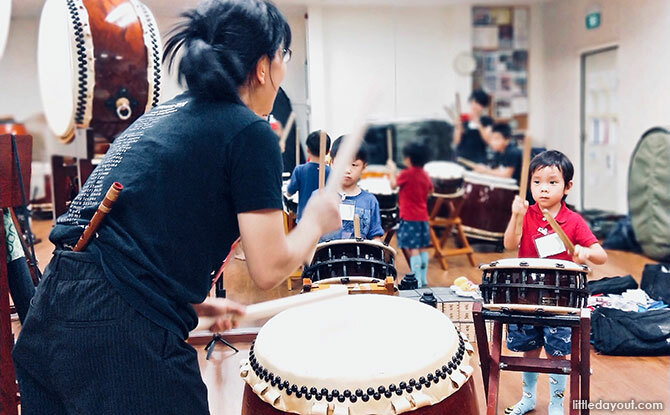 Drum sticks, or bachi, are then handed out as each student takes their place behind a medium-sized drum – a nagado – while Namiko-san launches into the basics of how to play taiko, such as the correct way of holding the drum sticks. 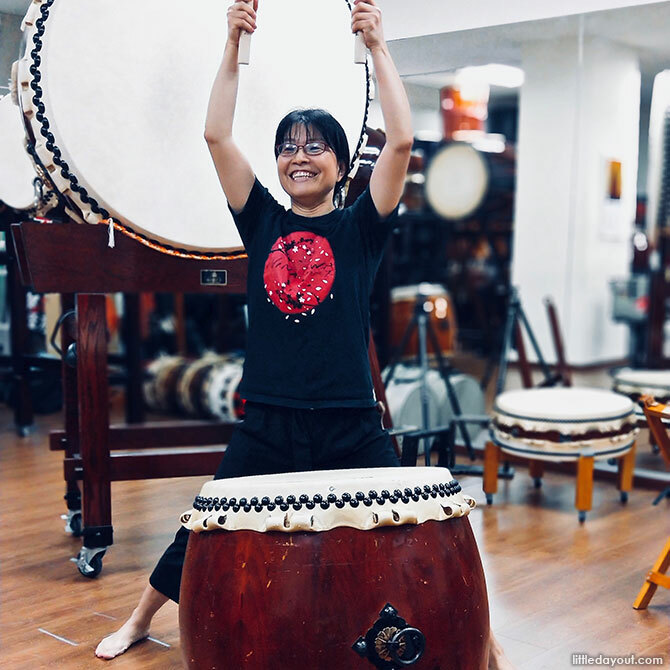 Namiko-san is a bundle of energy to say the least as she enthusiastically takes the students through the 45-minute class that covers taiko fundamentals, from standing strong and confidently, to accurately keeping in time, and even gesturing with gusto. 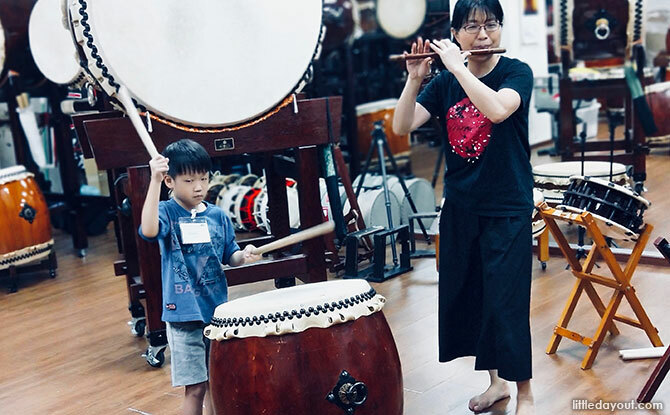 The students are also given the opportunity to experience different taiko drums, including the shime-daiko, which has a higher pitch than that of normal taiko and is in fact, the “conductor” of a taiko ensemble. 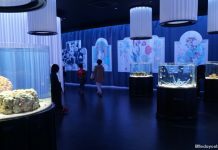 At that, Namiko-san whipped out a shinobue, a traditional Japanese transverse bamboo flute, the sounds of which so naturally complemented the hollow taiko beats and really brought the music in the studio to life. 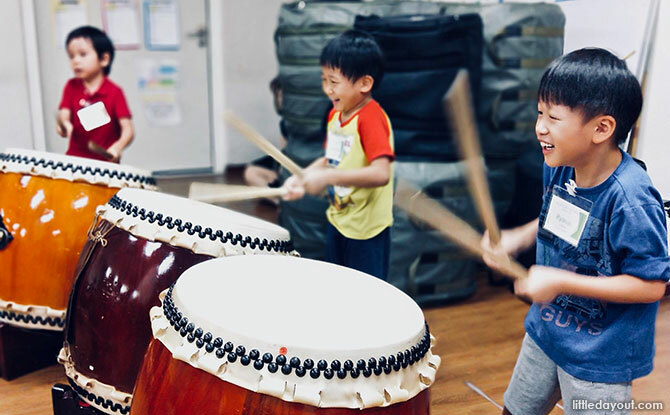 The pace of the class is as dynamic as the spirited taiko beats, so it isn’t hard to see why the children – and their parents – return month after month. 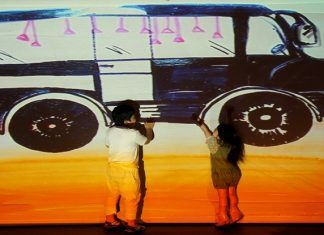 There isn’t a dull moment during the lesson, and by the end of it, children’s eyes are gleaming with excitement. Namiko-san wasn’t kidding when she said that a taiko drum class is a great workout; it’s an amazing form of stress relief too! 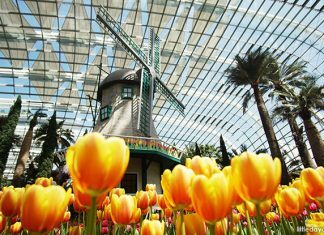 This is certainly one for the bucket list of things to experience together as a family.